Messrs Lackington Allen & Co.
bl.uk > Online Gallery Home	> Online exhibitions	> King George III Topographical Collection	> Messrs Lackington Allen & Co.
View of the premises of booksellers Messrs. Lackington Allen & Co. in Finsbury Square. The building was named The Temple of the Muses. It was run by James Lackington and his partner since 1793, Robert Allen. 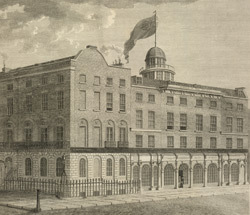 The building was considered one of the great sites of London - its front was 140 ft wide and the roof was crowned by a dome (the flag flew when James Lackington was in residence).